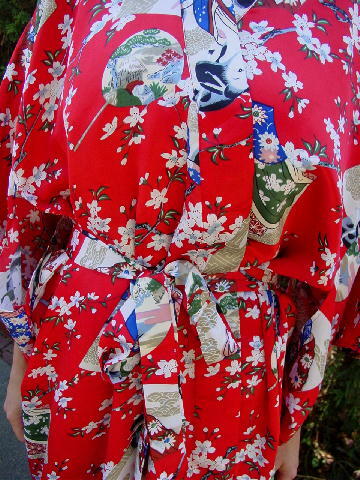 This red background kimono is 100% polyester and was made in Hong Kong. 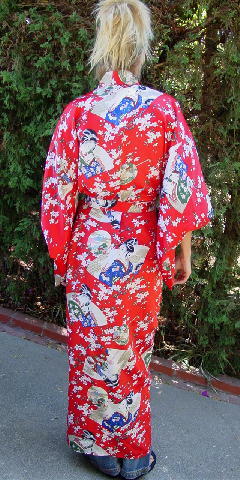 It has a design pattern of flowers, leaves, and ladies in different poses. It's in greens, blues, white, blue-gray, pink, black, brown, pale yellow, and grayed silvery-bronze. There is a fabric matching double sided belt. The sleeves have an inner side 6 3/4" opening upward from the bottom. The upper outer side has an 8" long opening. 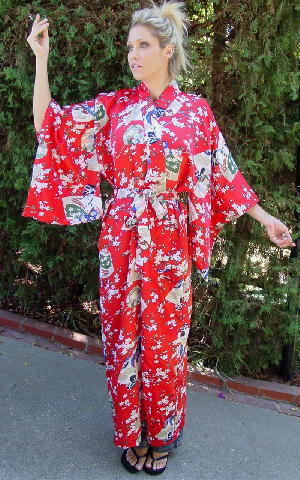 The outer sides of the kimono have 3" long slit openings. The right front side has little dark spots 23 1/2" downward from the shoulders and 3 3/8" inward from the front edge. When you cross the left side over the front, the spots are not visible. It's from a former Hollywood actress. shoulder to shoulder 24 3/4"
shoulder to hem 59 1/4"
belt 77 1/4" by 1 5/8"